What is it? Botox® is the brand name for Botulinum toxin A. For many years, Botox® has been used therapeutically to treat a variety of medical conditions, specifically neurological disorders. It is successfully used in the treatment of Strabismus, Blepharospasm and Cervical Dystonia. Each of these conditions is related to involuntary muscle contractions, more commonly known as muscle spasms. Treatment is not permanent however, usually lasting three to eight months on average. In 2002, Botox® was approved by the FDA for the treatment of moderate to severe frown lines between the brows. Cosmetically, Botox® has been used successfully for a number of years to treat severe Glabellar, better known to most of us as frown lines. It has been approved for use in treating patients up to 65 years of age. A form of Botulinum toxin type A is injected into the muscles around the brow area, effectively paralyzing the muscles and preventing them from scrunching up. This means the wrinkles, frown lines or furrows temporarily go away. People have been drawn to this method of reducing the effects of aging as it is a simple yet effective procedure that carries very little risk for patients. At Dr. Salomon’s Miami office, we provide the highest level of care while customizing each Botox® treatment specific to our patient needs. Botox® effectively blocks nerve impulses that cause muscles to contract, and as a result enables them to relax. This reaction causes the wrinkles in the skin to gradually soften and often disappear. Botox®, when administered by an experienced physician like Dr. Salomon do not affect your ability to smile, laugh, or otherwise show expression. Botox® is administered directly into the neuromuscular tissue via a thin needle injection. Dr Salomon will determine the exact location and dosage specific to your needs in order to achieve the best results. Botox® injections can be scheduled at any time and require zero downtime following completion. Since there is minimal discomfort, patients are able to return to their normal routine immediately following their treatment. Patients notice maximum results within 1-3 days; however, in rare circumstances, full effects may take up to 5 days to be seen. Results will continue to improve for up to 2 weeks following the initial treatment. The results of Botox® injections have been shown to last up to 6 months. Are there any risks or side effects to Botox® injections? As with any medical procedure, there are always possible risks and side effects to consider. The highly trained, professional team at Dr. Jhonny Salomon Plastic Surgery & MedSpa will do everything to ensure maximum comfort while incurring minimal risk. Generally speaking injections with botulinum toxin are very well tolerated and very few people experience side effects. Negative responses to a drug due to a genetic predisposition are not common; they are usually rather mild and are transient. 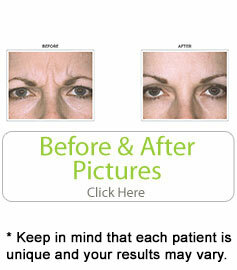 Below you will find possible side effects, which could occur as a result of Botox® injections. Mild pain at the injection site. Is Botox® safe for everyone? Women who are pregnant or breast feeding should not undergo Botox® injections. People with any sort of neurological disease should not use Botox®. As with any cosmetic procedure, Botox® is not suitable for all patients. For this reason, it is important to schedule your complimentary consultation with Dr. Salomon and his Miami team prior to your procedure.